Researchers at the RIKEN Center for Sustainable Resource Science (CSRS) have discovered a new, yet simple, way to increase drought tolerance in a wide range of plants. Published in Nature Plants, the study reports a newly discovered biological pathway that is activated in times of drought. By working out the details of this pathway, scientists were able to induce greater tolerance for drought-like conditions simply by growing plants in vinegar. 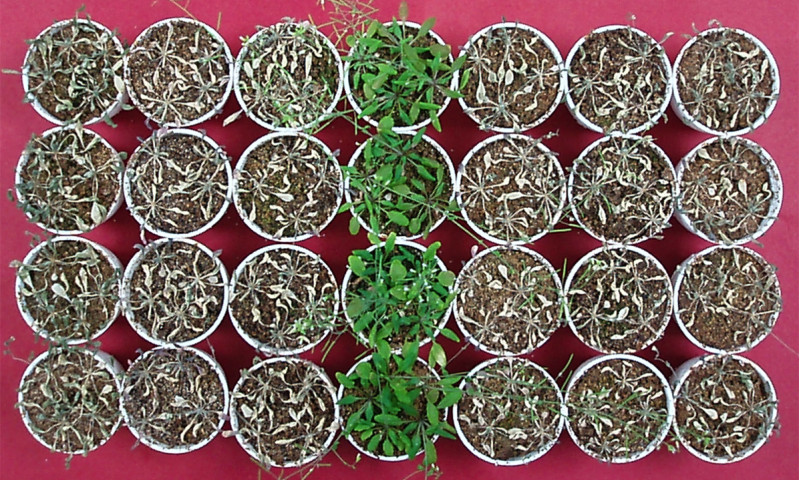 Led by Jong-Myong Kim and Motoaki Seki at RIKEN CSRS, the large collaborative effort began with the discovery of novel Arabidopsis mutants that have strong drought tolerance, although the reasons were unknown. These plants have a mutation to an enzyme called HDA6 (histone deacetylase6), and the first goal of the current study was to determine exactly how this mutation allows the plants to grow normally in severe and extended conditions without water. Kim and Seki say that this project has led to several important discoveries. Not only did they discover that external application of vinegar can enhance drought tolerance in the Arabidopsis plant, but they also found that this pathway is regulated epigenetically and conserved in common crops such as maize, rice, and wheat. Initial testing in normal Arabidopsis under drought stress showed that genomic-wide expression of hda6 was linked to activation of the biological pathway that produces acetate, the main component of vinegar. In the mutated plants, they found that under the same conditions, this pathway was activated even more, and plants produced larger amounts of acetate. Further analysis showed that activity of the HDA6 enzyme acts as a switch that controls which type of metabolic pathway is active. Normally plants break down sugar for energy, but in time of drought, they switch to the acetate-producing pathway. The team next measured acetate levels in normal plants and found that the amount of acetate produced by plants during drought directly correlated to how well they survived. To confirm this, they tested plants with mutations in two of the genes found in the acetate-biosynthesis pathway. Results showed that these plants produced less acetate and were more sensitive to drought than normal plants. These results predicted that increasing the amount of acetate in plants could help them survive drought. The team tested this hypothesis by growing normal plants in drought conditions and treatment with acetic acid, other organic acids, or water. They found that after 14 days over 70% of the plants treated with acetic acid had survived, while virtually all other plants had died. The scientists mapped the entire signaling pathway from the HDA6 switch, and realized that this pathway is highly conserved across different plant species. They performed the same experiment as described above, and found that drought tolerance also increased in rice, wheat, and maize when the plants were grown in optimal acetic acid concentrations. Kim notes the significance of this finding. "Although transgenic technologies can be used to create plants that are more tolerant to drought, we must also develop simple and less expensive technologies because genetically modified plants are not available in all several countries. We expect that external application of acetate to plants will be a useful, simple, and less expensive way to enhance drought tolerance in a variety of plants." Is it possible that the vinegar is allowing for arbuscular mycorrhizal fungi to colonize the root systems and make the plant more drought tolerant?